This week’s Secret Ingredient for Friday Foodie Fix is Apples! I love apples. My favorite is the Winesap apple. I have great memories of when I was a kid and we would make our annual trip to the Orchards. We would get a whole basket full of Winesap apples. It was such an exciting event for me. Linvilla Orchards was not far from where I grew up and it is still a thriving orchard where you can go and pick your own. This is also the time of year that Apple Cider starts appearing in the grocery store. I love apple cider. I hope someone has a great gluten free recipe for apple cider donuts that is easy. Apples are a wonderful food to have around. They don’t need to be refrigerated, travel well, gluten and dairy free and vegetarian and vegan. 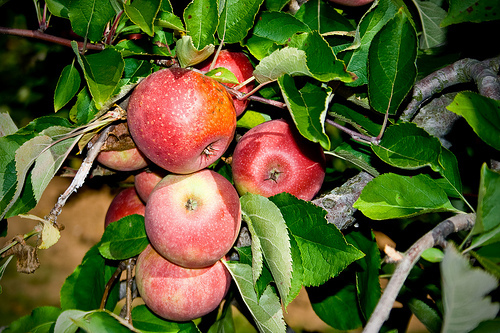 There are over 8000 varieties of apples but they can all trace their roots back to the wild sour crab apple. Apples come in all sizes and colors and contain vitamins A, B, and C, magnesium, iron and manganese. Fall and Winter are peak season for apples. If you can, buy from your local farmers. These will be the freshest. Apples will generally last a week in the refrigerator but there are ways to winter them. This requires tissue paper, slatted wooden boxes and a cool dry well ventilated place. Recently, my favorite apple recipe is the Apple Cinnamon Muffins I made from Elana Amsterdam’s book The Gluten-Free Almond Flour Cookbook. Great book, just get one and you’ll thank me. I also like to make Apple Pupusas. I hope you will share your apple recipes here and then check out what others have shared. Feel free to leave as many recipes as you like and share that link love back to this post. 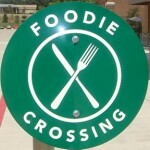 Read up for more details on Friday Foodie Fix. Next week’s Secret Ingredient is ………….Potatoes! Everyone had apple trees when we were growing up … now they are not that common. I hate to admit it, but I like some of hybridized apples, too … like Ginger Gold and Honeycrisp. So delicious. But, it makes me sad that so many varieties of apples have disappeared over the years. I was just looking at that muffin recipe of Elana's last night. Yummy. Will definitely make that one soon. Have other baking plans with another camping weekend (maybe the last?) here. I shared my super easy, wonderful apple pie recipe. It can be made dairy free, too. Read the comments for suggestions on that from a support group member/reader. Looking forward to all the great recipes … fall is almost officially here! 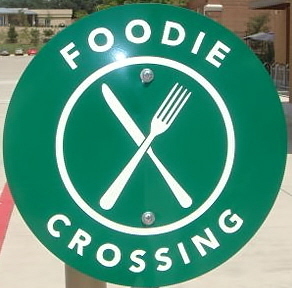 Thanks for hosting Friday Foodie Fix, Diane! Shirley- Thank you for sharing your recipes. It's always great to see what you're cooking. I have eaten all of my apple muffins I made from Elana's cookbook so I see a day of baking on the horizon! I'm like Shirley – I eat an apple every day. There is a HUGE difference in taste between regular apples and organic apples, too. I've had some of the best red delicious organic apples – but non-organic, they're kind of bland and tasteless. I linked to a blast from the past – Fresh Apple Cake. It uses LOTS of apples and just enough batter to hold them together. Yum! Amy- Thank you for sharing your recipes. I too love apples. I'd like to eat one a day but try to keep to my 4 day rotation. Seems to work for my body. I have two other apple recipes, but they both call for oats. Do recipes with oats fit the bill for FFF since you can buy GF ones, or is it too iffy? Alisa- Yes I say oats that are gluten free are great. Some people who are just making the shift to gluten free and have had many years of damage are often told to hold off and wait to re-introduce gluten free oats. The key is that they say gluten free, otherwise they have a high risk of cross contamination. I wouldn't eat oats that didn't say gluten free. Love apples and oats.